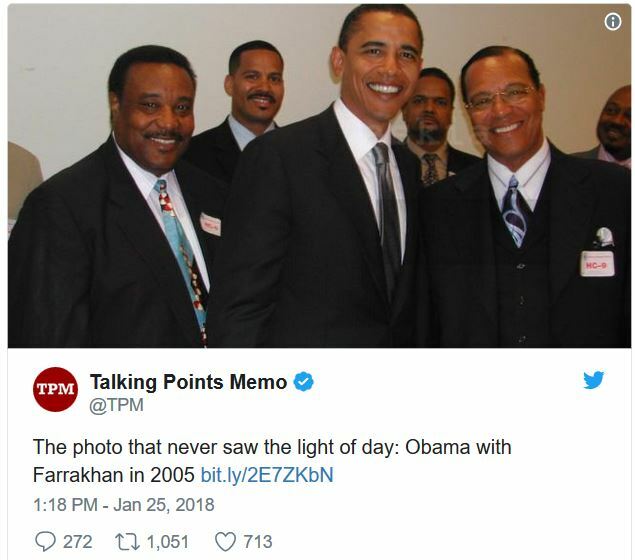 From TPM, a journalist just came forward after waiting over 10 years to say he will nos publish a photograph of then-Illinois Sen. Barack Hussein Obama (D) and Nation of Islam leader Louis Farrakhan that he took in 2005 at a Congressional Black Caucus meeting. See picture HERE. The journalist did not make public because he believed it would have “made a difference” to Obama’s political future. But if it was a damning photo of a Republican presidential candidate or tape, the media would have been all too willing to make such a pic available to hard a candidate. How would the have played in the 2008 presidential election had this picture actually been made to the public? Isn’t it quite something that such damning photo’s are buried, yet we have 30 year old year books come out of the wood works when it comes to GOP candidates. A smiling Obama and Farrakhan, don’t they look so chummy? It makes one wonder what else was covered up, doesn’t it?